I think the concept of the monastery is always up to date whether it is in medieval times or the 20th century. The point being that there is some kind of discipline and some kind of natural dignity that the monastic tradition displays. Gampo Abbey is committed to offer monastic training with compassionate and skillful guidelines in how to embody the teachings, how to work with each other and how to speak genuinely and listen fully to each other. This training is further enforced by the Vinaya (the traditional monastic Buddhist code). The promise of awakening is realized through the fearlessness to overcome the obstacles that cover up our natural inherent, innate, always present wakefulness, which is also called basic goodness. At Gampo Abbey, we allow our outer forms to tame us thoroughly. 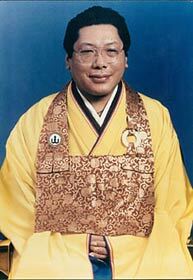 The unifying factor, the backbone defining the Gampo Abbey monastic experience, is the Shambhala Terma teachings of our founder, the Vidyadhara Chögyam Trungpa Rinpoche: the collective project to create an enlightened society. Throughout their stay at the Abbey, all residents, including those coming from other traditions, will be exposed to the Shambhala teachings and be invited to follow the first levels of training. Joining an intentional community creates a container that supports each individual’s efforts at waking up and developing mindfulness and encourages self-responsibility. The container minimizes choices and heightens awareness through providing a clear schedule and structure. At Gampo Abbey, one has a combination of scheduled practice, study, work, regular house chores and occasional service for visiting teachers or special programs. All residents agree to abide by the five Buddhist precepts (not killing, not taking what is not offered, not lying, no sexual activity, no intoxicants), to fully participate in the daily schedule and the observance of silence and to attend the bi-monthly Sojong purification ceremony. Through vows and commitments, relating to our life with an open heart and mind becomes choiceless. Then our senses open up, we become relaxed and we can enjoy experiences in ways otherwise not available. When everyone is moving in the same direction this develops windhorse or lungta, the energy to raise ourselves above conventional mind, above doubt. This is the inner magic of working together as a community. 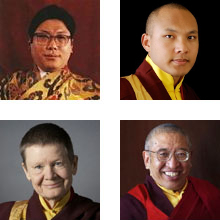 Under the spiritual guidance of Sakyong Mipham Rinpoche holder of the Shambhala lineage, our Abbot the Venerable Khenchen Thrangu Rinpoche, our main teacher Gampo Acharya Pema Chödrön, and senior monastics, the Abbey community is committed to developing monasticism within the tradition of Shambhala Buddhism drawing from its Kagyu and Nyingma lineages.